Brand New Listing! Centrally located! Very close to Downtown Palm Springs! Newly Renovated! 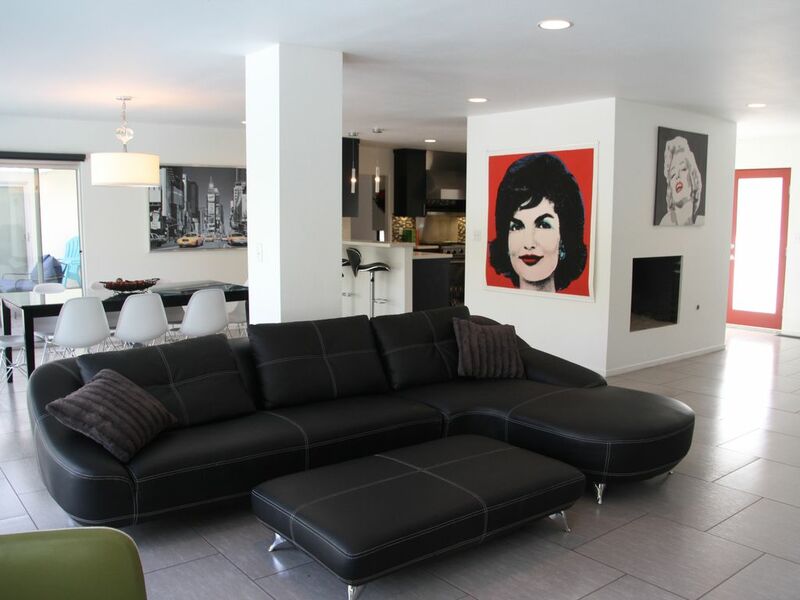 This fabulous remodeled mid-century Alexander built home has it all, a place to play, a place to cook and a place to rest. Play in your pool with Western mountain views, cook in your mini-gourmet kitchen or barbecue on your slate patio or rest in one of the four spacious bedrooms. Four porcelain tile floors, dual sinks in the master bath, Viking and Westinghouse stainless appliances. Caesar stone counters. A wall of glass door entrances from the house to pool offers an open feel to this comfortable house. The indoor living room has a 60" TV with a comfortable seating for relaxing with friends and family watching television or just catching up.The large dining area and modern kitchen are separated from the living room, providing everything you need to cook a great meal while entertaining friends and family. 4 spacious bedrooms with queen size beds and cable TV's. Recently updated, no expense spared! Central air conditioning, ceiling fans in all the bedrooms. We had a lovely 4 day weekend with the family. Cooking, hanging out, hot tubbing. There were 6 adults and 1 kid. The house was very comfortable, with lots of space and natural light. The kitchen had all we needed to cook some wonderful dinners. Sheryl is a gracious host and very responsive to any questions you might have. Palm Springs is in a great location for some amazing hikes and culinary adventures. Highly recommended. This four bedroom house has everything needed for a vacation stay. It is well designed, well appointed, spacious, and has an amazing view of the mountains from the main living area. The pool is lovely and so is the entire outdoor living area. The kitchen has everything we needed for cooking and entertaining. We will go back to Palm Springs and if it is available, we will stay there. Thank you for staying with us! You were perfect guests. Beautiful house with lots of extras. Even if the weather was funky, the house was great. A rainy day in Palm Springs was not what we were planning, but hanging around at the house, and having a heated pool and jacuzzi was great. The kitchen was well equipped and the BBQ was excellent. We would definitely book there again. This Is a Very Big House, with 4 Rooms in an Excellent Area. I Love that every Room had a TV, so everybody felt right at Home. The Living Room was Great, and the Dining area was Big enough for 8 people to eat Dinner in the same place. The View of the Palm Spring Mountains was Fantastic. a Good place to Vacation at. Wonderful house - great layout and kids loved the pool. This is a beautiful house with a wonderful layout both inside and out. We all loved the pool, especially the kids, and enjoyed cooking and spending time together. The owner is thoughtful and responsive and we hope to come back someday.